Paint is one of the most frustrating substances to spill onto clothing. Although the stain may seem permanent at first, there are a number of solutions to cleaning the mess quickly and salvaging the materials. Cleaning paint from leather shoes requires especially careful technique due to their delicate nature. Preserving the appearance of the leather will require specific materials for removal, but the proper method will help restore the shoes to their original condition. Salvage your leather shoes by using a number of methods for removing paint stains. Pad the spot of paint with a clean rag if it has been freshly spilled. 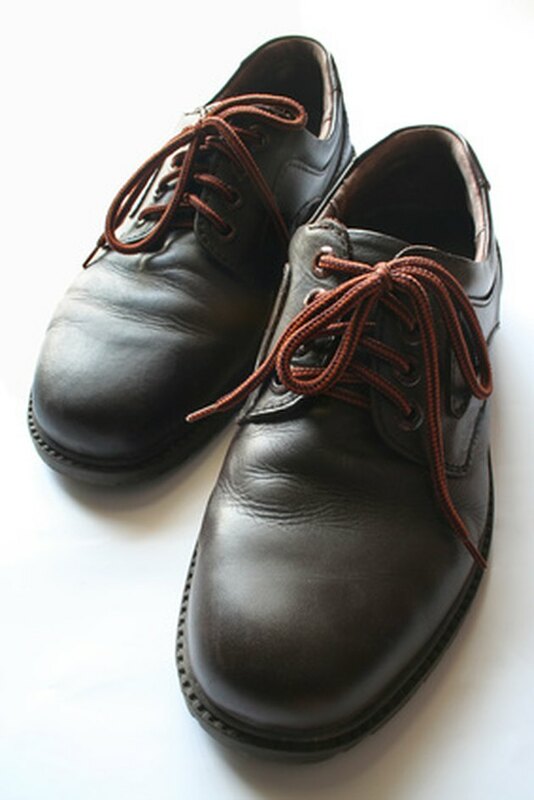 The paint can be easily removed from smooth leather shoes with the rag alone as long as it has not cured. Apply moisturizer to the paint using a clean finger or cotton swab, then wipe the paint off with a clean cloth. This method also removes paint stains that have not yet fully dried. Soak a cloth in warm water and place it over a cured paint stain for five to 10 minutes. The heat and moisture will soften dried paint and make it more pliable for removal. Carefully wipe the majority of the paint from the leather, or peel it slowly if it remains in a hardened state. Dampen a cotton pad with an acetone-based nail polish remover and dab the area until the remaining paint has thinned. Spread leather cleaner over the area once the paint has been lifted. Follow the manufacturer's instructions for a thorough cleaning and follow up with a leather conditioner to smooth out any dullness that maybe have resulted from removal.